The simplest way to install iOS 7 is with OTA update available in Settings directly on the device, but it doesn’t always work for everyone, particularly right now as Apple’s servers are overloaded. Also, many users trying to use the OTA update are encountering an annoying error that says “This update cannot be installed because it requires at least 3.1GB of storage.” or a “Software Update Failed” error when attempting to download the update. An alternate solution that will definitely work and avoid any failures or errors is to update to iOS 7 manually with the help of firmware files (IPSW). This method requires the usage of iTunes and a computer, and though it may sound complicated it’s really not. This specific guide will update an iPhone, iPad, or iPod touch to iOS 7. It does not perform a clean install or a restore, it simply updates the existing iOS 6 release to the new release of iOS 7. 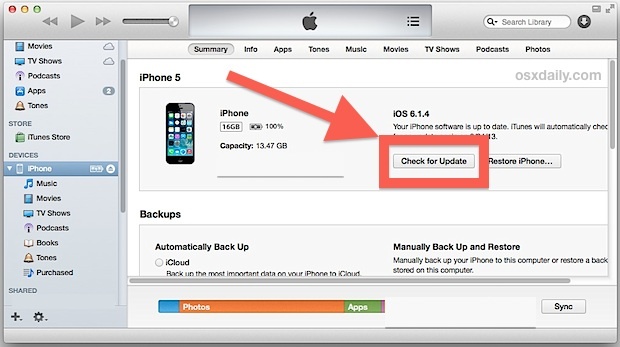 Back up your iOS device to iTunes, iCloud, or both before proceeding! If you want to be thorough, follow our iOS 7 preparation guide before beginning. That’s it, you’ll be up and running iOS 7 in no time. can u update using redsnow cause itunes is seeing the ipsw file as corrupted! its not shift+click, it is Alt+click. please be sure before posting , what you are posting, your wrong information waste some one time. it states to use alt-click, and shift click for older versions. maybe you should read the entire thing instead of skimming and you’d actually get the right information from it. No… Dude said that Shift+Click for older iTunes versions that mean not of the current version. No Matter and Not a issue to go with them. Wrong infor. Totally wrong. When you click update it wont ask for the file on your local computer but will start loading it from the server. can you tell me how it will done using windows? When they release updates as big as this, why the hell do they stop signing the previous one so damn quickly? !